A funny movie about one pretty wild night. Something different, this movie turns out to be a night of light-hearted fun. Yes, it’s rated R, and that definitely helps make the jokes funnier, but it’s more than the comedy that makes this movie so worthwhile. It’s also the story. From the way the movie takes the time to give us a montage about how the characters met, to the way the first scene in real time isn’t even the night of the party, but instead the game night before the one where things really go down, this one is all about getting us ready before the night of adventure actually begins. It’s a smart technique because it helps us get invested and ready to go, for when things really do start going down. And then the mystery is upon us, and it turns out to be three mysteries in one, constantly building on the one that came before it. The formula works, and the movie turns out to be a success. Game Night is fun. It’s clever. And it definitely knows what it’s doing. The premise alone is pretty great, with a bunch of couples and friends meeting together to play games and then learning that one of the friends has set them up for the ultimate game. It’s one of those role playing interactive games where he has hired a company to come in and get them to play parts in a murder mystery. We’ve all heard of things like this, with the newest craze of this sort called “Escape The Room,” and other things like that. We’ve seen shows and movies where a bunch of characters, (sometimes friends and sometimes strangers,) show up to a murder mystery mansion and have to solve the crime. But this one is a little different because the mystery comes to them, and the friends have to go out on a chase to follow the clues and solve it. The closest thing to this movie is the film The Game, with Michael Douglas, where a character seems to have everything in the world, and so his brother signs him up with this company that basically shakes his life up, making him go out on chases and adventures just to survive. 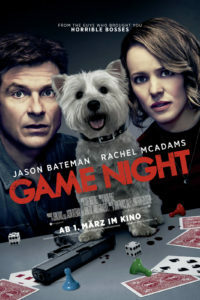 Only that was a one man against the world, suspense thriller, whereas Game Night is about couples and comedy. It’s as much about the laughs as it is about the thrills and excitement. And that’s important. Especially given the R rating and the likable and funny cast. There’s Jason Bateman in the lead role playing Max. The movie opens with a montage of how competitive he and his wife Annie, (Rachel McAdams,) are, and how they met each other while playing games at bars. This goes all the way through their proposal to each other and getting married. And then we are into the movie, with the night of the first party. Generally movies that are all about one night, and only that night, start off with a pretty cool idea. From Judgement Night to Date Night to From Dusk Till Dawn to Adventures in Babysitting, there’s a lot of potential to a movie that exists only during the course of one evening. But with this movie, which seems made for that concept, what’s pretty cool is that it actually gives us more than just the one night. We expect it to be all in one night, and so it gives us something a little different. 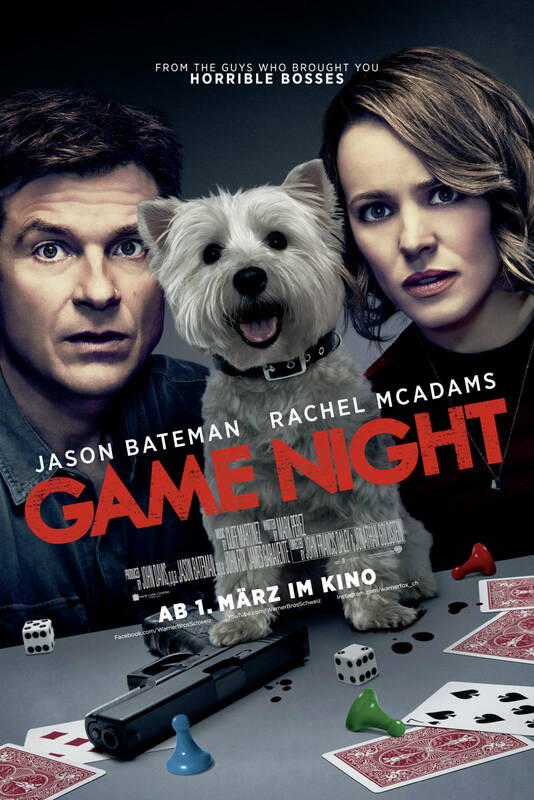 First, there’s that backstory montage, which kick starts the film, but then after that, we get a first game night, which is really just about getting to know the characters. During this first night, (which will not be the night of the adventure,) we meet Max and Annie for real, as they are hosting the evening. They have a great interaction in their driveway with the creepy neighbor, Gary, (Jesse Plemmons,) who is the cop that lives next door and wants desperately to be invited to their game nights. Only they don’t want him and are all creeped out by him, and have to pretend like they’re not doing anything that night. They get into a pretty funny conversation about “Scoops,” Nacho chips, and how they have three bags of it, with Max telling Gary that it was a three for one deal. He’s trying to cover the fact that they are indeed having a party. It’s because Gary is such a creep, and so suspicious of them, that Max and Annie have to tell their friends to sneak in quietly. And all the friends take that to mean sneak in through the windows. That’s where the first night of games begins. We meet Kevin, (Winston from The New Girl,) his wife Michelle, and their friend Ryan. He’s the guy who tries to stay single, and constantly brings a new date to every game night. The girl he brings to this first game night is pretty young and dopey. We also learn from this first night about Max’s brother, Brooks, (Kyle Chandler,) who Max is endlessly jealous of. Brooks has everything that Max wants and has always dreamed of, and they also always invite him to their game nights. Brooks shows up, they play a few games, and talk about how the next game night, which will be at Brooks’ house. And just like that, all of the relationships and history we need to know about has been established. Now it’s onto the actual night of adventure. It’s the night at Brooks’ house. Things start out with the characters being told of the company that has been hired to host the mystery, and with the couples sitting around playing drinking games while they wait. They play, “I’ve never,” and this leads to a very funny subplot. The clue is “I’ve never slept with a celebrity. Michelle apparently has. Which is news to everyone, especially Kevin, since the two of them have been a couple since high school. Throughout the rest of the movie, Kevin won’t let it go until he finds out who the celebrity is, and let’s just say this storyline does not disappoint. It has a great tag at the end, and even gives Kevin multiple opportunities to do funny impressions of the celebrity. But the real story is about solving the mystery. And that is not as straight forward as one might imagine. There are multiple layers going on here. First, an actor for the company,, (played by Jeffrey Wright,) shows up. He’s posing as an FBI agent and gives everyone documents to look over. But then all of a sudden two goons bust through the door and have a fist fight with Brooks. None of the couples are buying it, but Brooks continues to fight until the goons kidnap him. And the FBI playing actor insists that none of this was part of the game. So our characters go on a chase looking for Brooks and trying to find clues. They play as couples, on separate teams from the other couples there, and that includes sometimes playing dirty, (such as when one couple locks another one in a room to get a head start.) But it’s Max and Annie who are our leads, and so we stay with them the most. Luckily they know Brooks the best, and so they are the ones who find him first. but finding Brooks is just the start of the mystery. It unfolds into something much greater than that, including some mob figures that Brooks is in business with, and a list of names hidden inside if a glass egg. This all leads to some pretty fantastic moments. Mostly in comedy. The action is just okay, but it’s the comedy that really keeps our attention. When the characters find the egg, for example, they get chased through a house only to have a pass off game with each other, throwing the egg around like a football. And when they need to check a police data base to get more information about a name they come across, there’s only one place to go. Gary’s house, that creepy neighbor from the start of the film. The jokes continue from there. This movie works because not only does it have a clever story and some pretty goof laughs, but also because it keeps unfolding. By the end, we have three different layers of “game within a game,” kinds off situations, all built up ontop of each other. You don’t expect a comedy like this to be smart too, but this movie actually is. It’s not a great film., because it doesn’t excel in any one area, (for example, the comedy is good, but far from great,) however it does a nice job of covering all the bases, and working on most levels. There’s the comedy, the story, the characters, and the action. This movie definitely works on the comedy and story levels, and that’s enough to make the film a fun and enjoyable time.